Despite the well publicised hazards of working in heights, photographic evidence of domestic workers in Hong Kong in precarious situations indicate such tasks are still being done despite a government ban. A photo of a foreign domestic worker cleaning a window from the outside at the aftermath of typhoon Mangkhut hit Hong Kong circulated in social media. 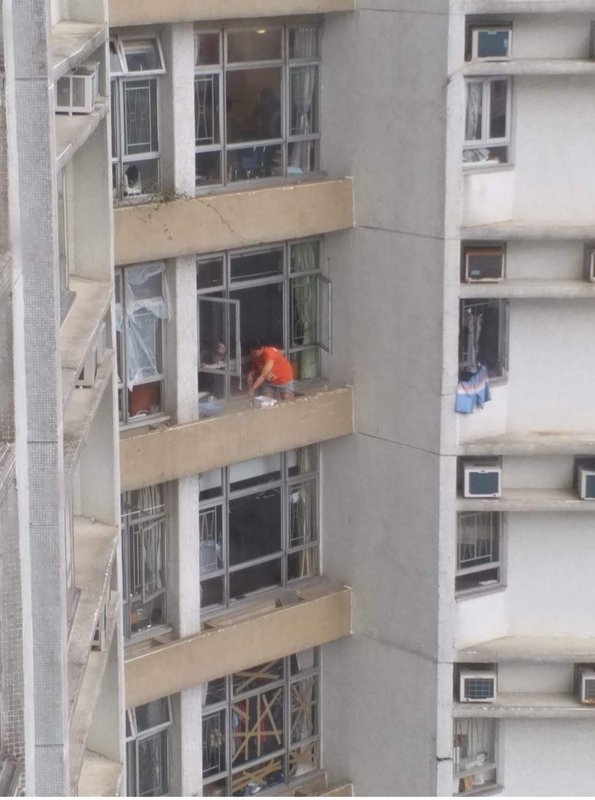 According to the Filipino helper who shared the photograph online, and requested not to be identified, it showed an unidentified domestic worker going outside of the window of her employer’s flat on the 14th floor of their tower in South Horizons at Hong Kong’s Southern District after the typhoon hit. The photographer said it was taken at around 9am while the typhoon signal number 3 was still raised by the Hong Kong Observatory. It was lowered from typhoon signal number 8 to signal number 3 earlier in the day. The Filipino helper’s Indian employer called her attention before calling the authorities to report the incident. “He was really angry when he saw this this morning. He was late for the office because of the typhoon,” said the Filipina. Starting January 2017, the Hong Kong government prohibited FDHs from cleaning apartment windows from the outside and this is clearly stated in their contracts. The Hong Kong Labour Department has urged the public to call the police if they see a foreign domestic worker cleaning a window from the outside and putting her life at risk. In July, an Indonesian domestic worker fell to her death while cleaning the window of her employer’s high-rise apartment in Tseung Kwan O.